Didn't get much stamping done this weekend, sometimes the mojo just isn't there. Did get some house cleaning done today though and that always makes me feel better! Gotta stamp tomorrow-have a swap due this week!! Did manage to create a card tonight, based on the Diva Coffee Break sketch of the week. I just got the En Francias background stamp and this idea popped into my head. Quick and easy, and any color would work! Card base is Melon Mambo. I'm obviously still in the mood for Spring-any color outside would be appreciated right now-LOL!! Background is Whisper White stamped with the En Francais background. Corners were rounded & edges sponged. Center layer of Melon Mambo has a Thank You from Kind Thanks stamped at the bottom in Melon Mambo on Melon Mambo. The large flower from the pretties kit was stamped with En Francais in Melon Mambo and the edges sponged. I punched a 3/4" circle of Melon Mambo and attached in the center. I then added a Pop-Up Glue dot in the center and applied Micro Beads. Nice, and bright, and cheery! Don't you love Melon Mambo? It's such a great color! 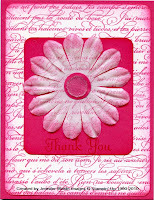 This is a great card to case, 'cause like you said~~it is doable in any color!